"The Brexit saga is entering a new, critical phase. A crisis could change everything...There is already a narrative building that politicians are incapable of sorting this out and it must be therefore the people who decide." Over the last few extraordinary weeks, the chances about the following have risen. A 'hard', no deal Brexit. An extension of Article 50 beyond next March. A new Tory leader and PM. A constitutional crisis, resulting in a 'Peoples Vote' or another general election. Another Scottish independence referendum. Even a realignment of the UK party system. Confused? Don't worry, you're in good company. The government evidently don't know what comes next and nor, apparently, does anybody in politics or business. None of Betfair's wide array of markets related to this unprecedented situation offer clear, confident signals. One thing that has become clear is the implausibility of Theresa May's stated plan. The Chequers deal was always an internal Tory party compromise, unlikely to survive parliamentary scrutiny, let alone be accepted by the EU. It has already failed the first test, undone by several Brexiter amendments and splitting the party, perhaps irrevocably. On the basis of those amendments and rhetoric from new Brexit Secretary Dominic Raab, the ongoing EU negotiations appear doomed. By threatening to withhold the £39BN 'divorce settlement'. 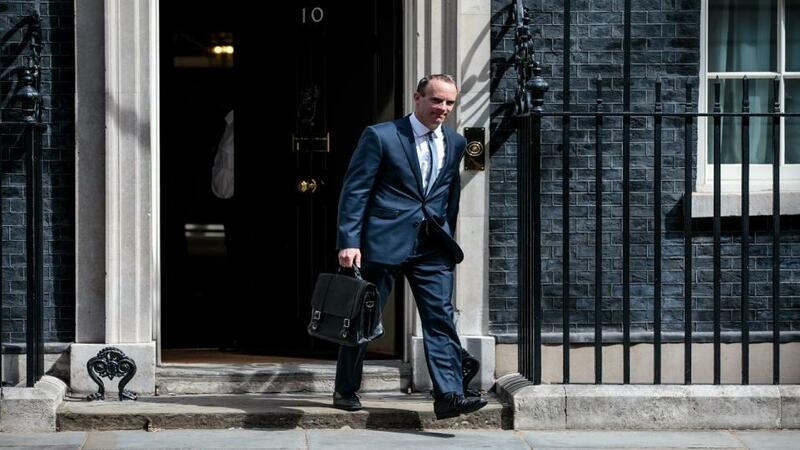 Raab may have just placed a bomb under the whole process. The EU regard that payment as a totally different matter to any future deal - a legal obligation - that had already been settled, as a precuser to the current talks. May is adamant that she won't request an extension to Article 50, but many observers say the timetable may leave little choice and bettors are not taking her word for it. The UK withdrawing on 29/03/19 deadline can be backed at [1.75]. As I wrote a fortnight ago, this is the PM's moment of maximum peril. Support among Tory members for May's plans has already collapsed - two-thirds in yesterday's ConHome poll consider it a 'bad deal'. Opinion among those members already leans strongly towards no deal and events in October will likely entrench it. Oct-Dec is now clear favourite at [3.5], having been recommended earlier at [6.6], in our Theresa May Exit Date market. Even if an uneasy truce were to break out among Tory MPs, and a slow, gradual Brexit, via a lengthy implementation period agreed, it isn't clear that May would be able to deliver it. To the overwhelming majority of Leavers, she will be seen to have failed on her own terms - that 'Brexit means Brexit' and 'no deal is better than a bad deal'. To her party, she will be as Jacob Rees Mogg describes - a 'Remainer who is still a Remainer'. In a significant intervention last week, this ConHome leader column laid out a way forward that would mean May has to quit. They call for parking the UK in the EEA for up to four years, after which time 'no deal' WTO rules will kick in and all the necessary plans to manage that are in place. They argue that such a plan, that observes the letter of the referendum if not quite the spirit, could only be pulled off by a new Tory leader that supported Leave in 2016. I agree. Note too they flag up my long range pick Dominic Raab as well positioned. The New Brexit Secretary is available to back at [15.0] to be Next Conservative Leader. His weekend comments about the divorce bill are pure gold for the base and I can see him emerging as strong favourite to succeed May after October. None of this, however actually deals with the fundamentals. Whatever path the Tories eventually decide upon will require the consent of parliament, and there is no majority right now for a no deal Brexit. Unless something changes soon, we are heading towards deadlock and a constitutional crisis. Evidently, few Tories wants a second referendum or another election that could put Jeremy Corbyn in Downing Street. Unless something gives, they may end up with no choice. Support for a so-called Peoples Vote has been rising slowly and has the support of roughly half the country. Opinion on either side has been entrenched ever since the referendum but the drama and changing narrative over the coming months could be a gamechanger. The media is suddenly full of scare stories regarding a no deal Brexit. The government is building lorry parks and stockpiling food and medicines. Critically they are to send technical advice about the implications, and how to prepare, to households and businesses. Entrenched Brexiters will doubtless dismiss it as part of 'Project Fear' but that line may have less resonance than in 2016. Always be wary of overstating the level of engagement among voters, especially mid-term. Outside a small minority of ultra-engaged - almost all of whom are among the 17% of the country on Twitter - most voters are still discussing Brexit in the same terms as 2016. Once their government, employer or union, starts giving specific, practical advice regarding a state of emergency, the mood among voters might shift. Developments within Labour could also have a profound impact. A big majority of Labour members and voters are Remainers. A clear majority of Unite members support a Peoples Vote. They are pressurising Len McCluskey to pressure the Labour leadership into backing it, as are Momentum are pushing hard for a debate and vote at the party conference. Like May, Corbyn has been walking a tightrope, trying to keep Labour and their voters united, and the crunch moment is imminent. He was elected on a platform of handing policy-making power to the members and conference. That grassroots pressure could well force Labour into backing a second referendum and it would give Corbyn a legitimate excuse for the u-turn. The Brexit saga is entering a new, critical phase. A crisis could change everything. Hostility to the EU, and therefore support for a hard Brexit, could rise after negotiations fail. A currency crash, chaotic preparations or constitutional crisis could shift the narrative towards Remain. Public opinion might even start coalescing around some sort of 'national unity government'. A new anti-Brexit party might finally emerge. Only a mystic could confidently predict how it pans out but I can't see how the stock of politicians rises. There is already a narrative building that politicians are incapable of sorting this out and it must be therefore the people who decide. A second referendum before 2020 is currently trading around [3.9], equivalent to a 26% likelihood. Expect those odds to shorten over the coming months.